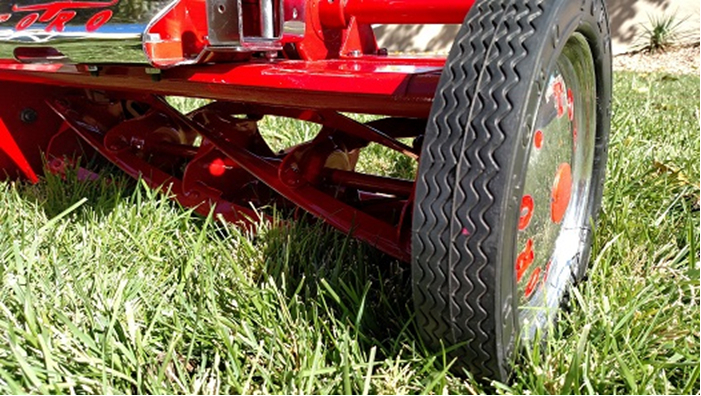 This may be the world’s best surviving 1955 Toro Sportlawn 21”. We’ll let you decide. I would like to share with you my son, Charlie’s, 2015 summer project. Kids these days seem to use all their time playing video games, sitting in front of a TV, or on their cell phones. I wanted to find a project to share with my son that was not only fun but taught a valuable lesson. 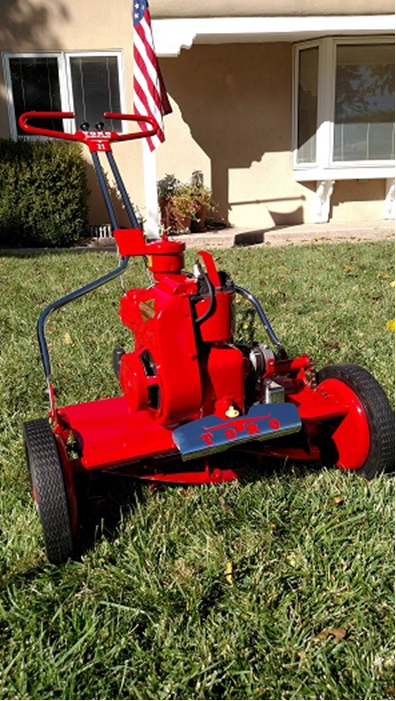 We found a 1955 Toro Sportlawn 21” mower for sale on Craigslist and thought, “This is it!” The 60 year old lawn mower was rusted, missing many pieces, and had cracked tires. 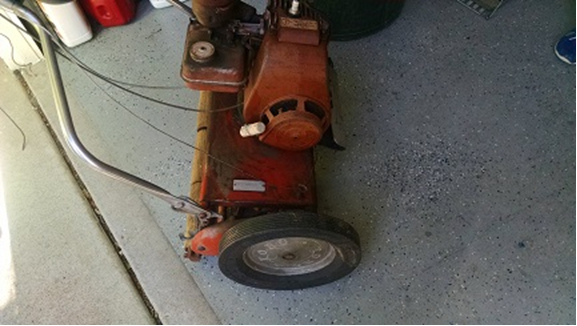 The first step for Charlie, being 11 years old, was to take many pictures of the mower as a reference for the reassemble. 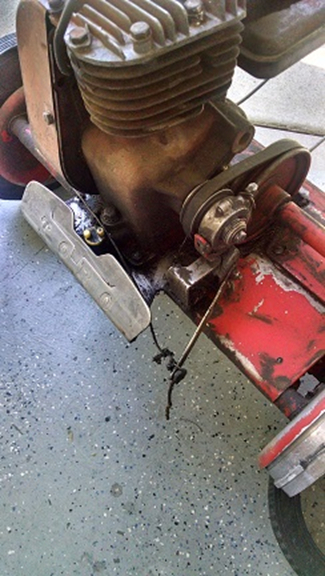 The mower was then completely taken apart, every single nut and bolt including the engine. Over the next several weeks each piece was degreased and sand blasted. We made our own homemade sand blast cabinet using a cardboard refrigerator box with a piece of Plexiglas and LED lights for viewing. Next, we sent the necessary parts to the chrome shop and began searching for missing pieces. Originally, I thought we could find replacement parts on the internet. 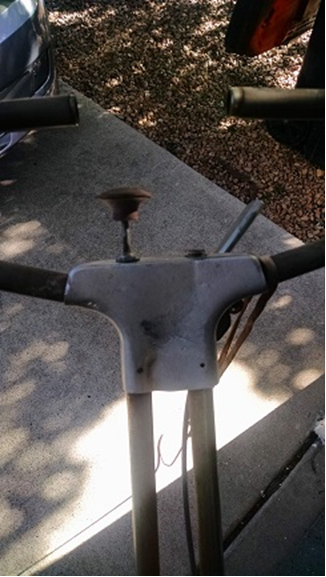 I did not anticipate how difficult it would be to find original 1955 Toro parts. 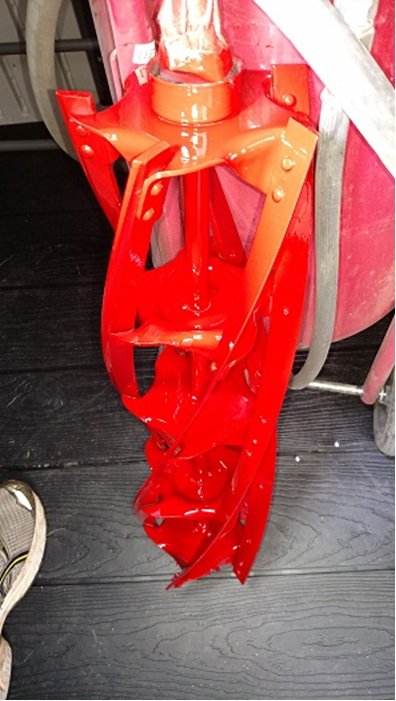 Locating original Toro solid rubber tires was near to impossible and almost stopped the completion of the project. While the search continued, Charlie and I visited the automotive paint shop to purchase high quality primer and paints. With every part disassembled and properly cleaned, painting was easy. Charlie learned to use a spray gun to get a clean even coat. 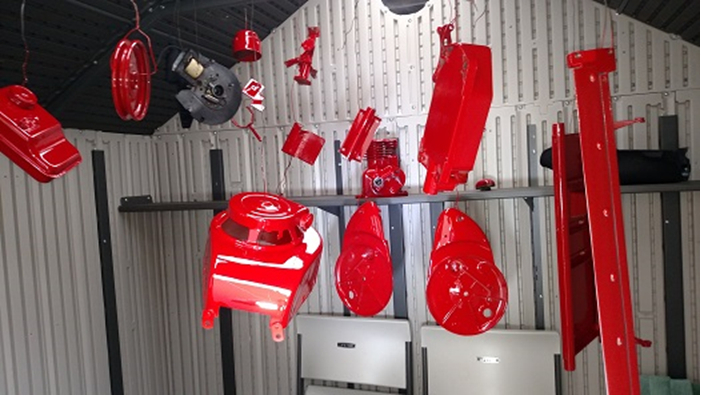 We let the painted parts dry and harden in our shed for several weeks. All the while, searching for those tires. 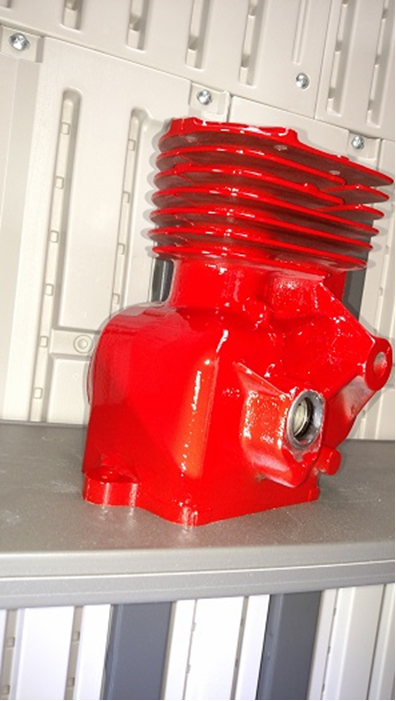 Once the rebuilt parts for the Briggs and Straton 5S engine arrived, we began to assemble the engine. 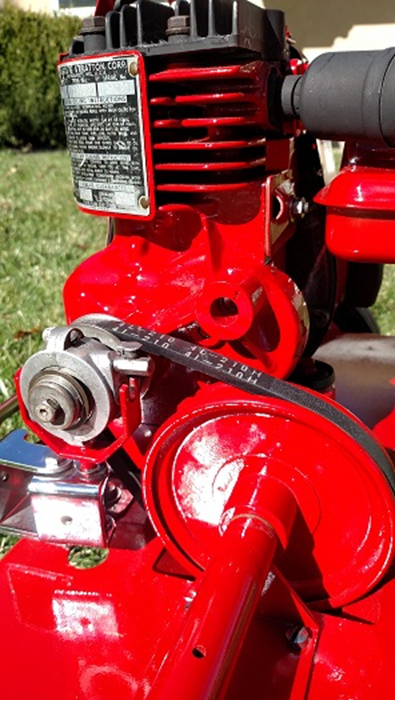 We honed the cylinder, installed new rings, new bearings and new seals. We lapped and adjusted the valves. 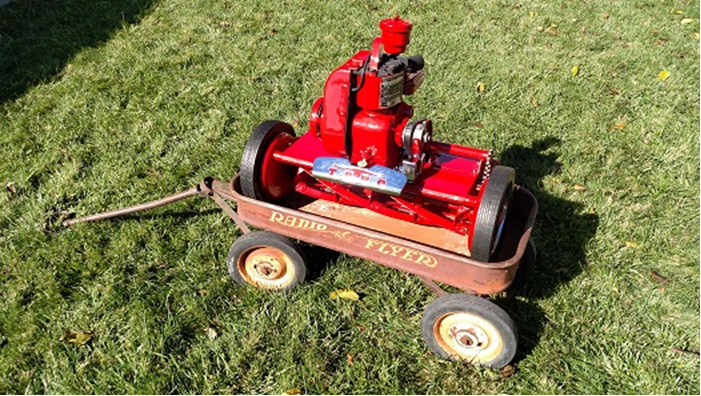 To our surprise we were able to buy 1955 reproduction engine decals. It looked beautiful but we didn’t know if it would even start. Reassembling the Toro deck was also a great learning experience. Charlie discovered that the complexity of the mechanical parts that went together to accomplish a designed function. We sharpened the reel blades by using valve grinding compound and spinning the blades in reverse against the cutting blade. After proper adjustment, the blade would slice through a sheet of paper. We were now getting down to the final details. The aluminum wheels that came with our Craigslist purchase were broken. 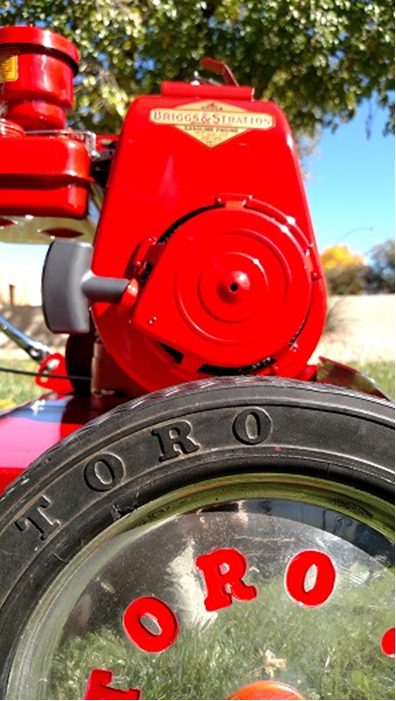 We located another 1955 Toro Sportlawn for sale 400 miles away. After a fun road trip, we had better rims to work with but still no tires. Charlie got the chance to use a large bench grinder with a polishing wheel and compound. Each rim was polished for two hours. After four months of searching, we found one set of unused Toro tires. 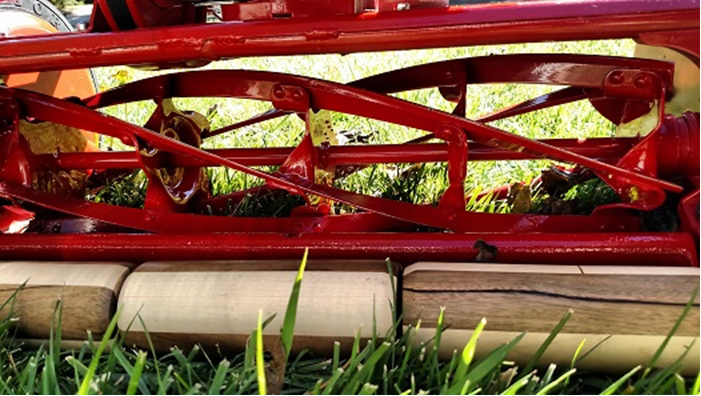 We had the rear wooden deck rollers turned from two different types of maple woods. All the parts came back from the chrome shop and they looked fantastic. 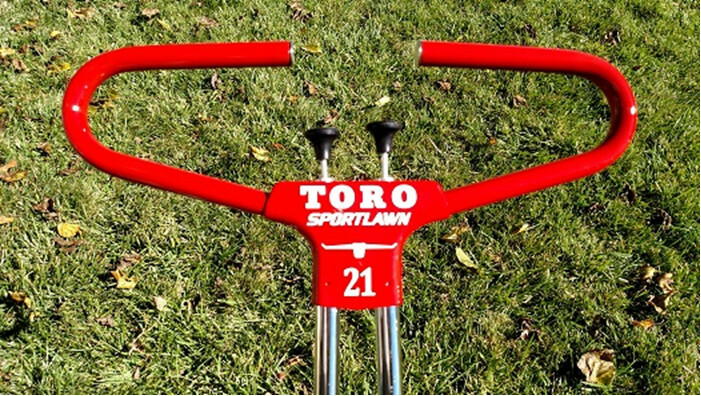 Final assembly went well and we were now looking at a 1955 Toro Sportlawn 21” that was probably in better condition than when it left the factory 60 years ago. 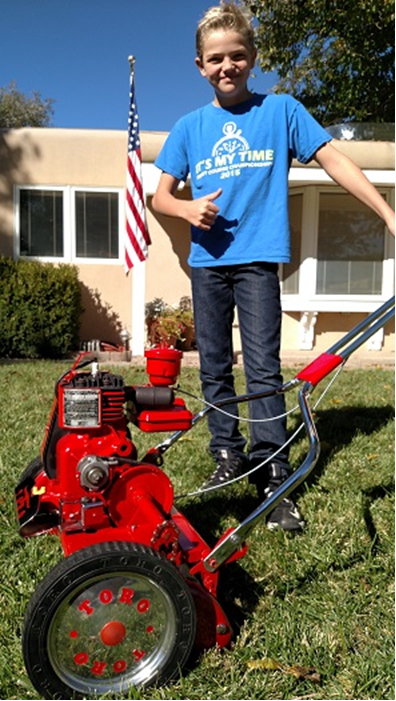 Charlie and I had a good laugh, we realized we had just built a lawn mower that was way too nice to ever use! We didn’t want to scuff the tires or scratch the maple rollers so we located a 1955 Radio Flyer wagon to haul it. We are not sure what we are going to do with it but we know the time we spent together was priceless.